Like most flatworms, Dicrocoelium dendriticum is very small and long. According to a study, it was shown that the daughter sporocysts found in the molluscs develop to lengths between 560 μm and 4160 μm depending on the stage of development that the sporocyst has completed. Inside the mollusc, the miracidium penetrates the intestinal wall and settles in the hepatopancreas where it becomes a mother sporocyst. 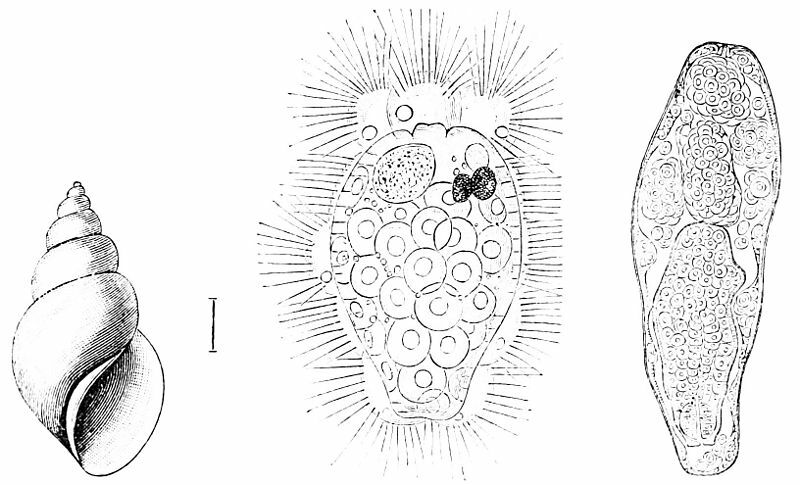 At this point, the sporocyst does not have a wall to support itself, so it forms and take the shape of the hepatopancreatic lobules it resides in. During this larval stage, sacciform daughter sporocysts with their own wall are formed, which then create cercariae when they mature. (Manga-Gonzalez et al. 2001). Dicrocoelium dendriticum is only affected by environmental stimuli if one of its hosts is affected. For example, all three of the hosts needed, the terrestrial snail, the ant, and the livestock, all need a certain climate and habitat to survive. Without this habitat, the hosts, along with the parasite, will die off. Other things that affect Dicrocoelium dendriticum are the species, age, and nutritional state of the snail ingesting the parasite larvae. All of these can affect the amount of parasite larval count and survival rate of the larvae (Manga-Gonzalez et al. 2001). The unique characteristic of this parasite is the use of its host to aid in transportation. Since it cannot travel on its own, Dicrocoelium dendriticum has a rather complex life cycle, which is explained in depth on the Life Cycle page. Without these three hosts, Dicrocoelium dendriticum would have no way to reproduce and transport (Otranto and Traversa 2003).